Hopefully they will provide you with the answers you seek. However, if you have a question that is not answered here, please send us a message through our Contact Page or calling us at 519-842-9554. Q How do I re-order prints? A You have a few options available to you. You can order by phone, email, regular mail, or by fax. (see examples below). In the apropriate photo section of our web site you will find the prices and our reorder forms. Print one out, fill it in and send it to us. See our Contact Us page for mailing address and additional info. Q How do I find the re-order number on your prints? A As shown the examples bellow, we need the Photo ID number from the first line of the series of numbers on the back of our photos. Numbers may be a bit different from previous photos, but the location has stayed the same. See the pictures below view examples of our Photo ID#'s. 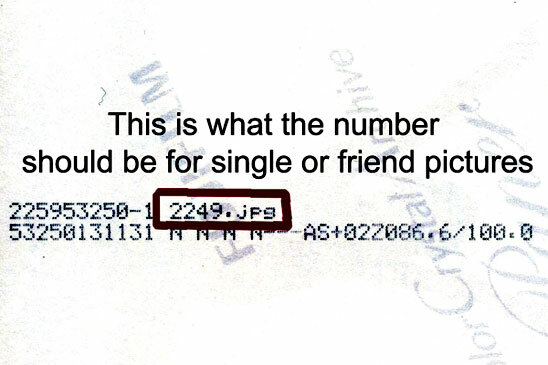 In both examples, we only need the #'s 2249 or 7393 as these are the actually Photo ID#'s. The rest is size, file type and our developer's number. Q Do you print on site? A No, we do not print on site. We used to do black & white printing on site, but it is more cost effective to get these printed at our Photo Developer, and we can pass on the savings on to you. Digital photos do make some things easier. As we do not print on site, this could mean that we do not get the photos back as quickly as we would like. Our Photo Developer is located in London. So we may need extra time for any orders that are rushed. So please make sure that you give us an extra day or 2. Q What do you do with your photos? A We do save our photos for a long period of time. We never know if a customer is going to want to order an older photo that we have taken some time ago. All photos are now stored digitaly, CD/DVD or HDD. Older photos may be stored as negatives, but take up a lot of space. After about 10 or more years we store the photos in our back room, from there they might get thrown out. We tend to hold on to more important photos, such as weddings or family portraits. Q How long do you keep printed photos? A We do a very large amount of printed photos, the majority of these are printed from February to July. If you where at a dance recital or a skating carnival and missed us, you may find the photos online or you will have to contact us about how to get these. We only keep the printed photos for 1 year. As long as you get in contact with us before then, we can send them to you much faster as we do not have to re-print them again. Generally this means we do some spring cleaning before our next busy sport season. We at Fred's are trying to help the environment as much as we can and recycle as much as possible. Q Why is the photo package kinda "ratty" looking? A We are trying to reduce the amount of waste we put out at Fred's. We want a clean environment too. So we recycle what we can from the previous sports season. The mounts are re-used, as well as the bags. We remove the tape from the packages, as best we can. The bags are just to protect them from spills ect., untill you get them home.